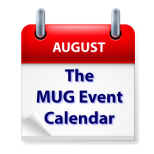 The August MUG Event Calendar is always a little slow as many groups enjoy their last week of summer break, but all is not quiet. Dwight Silverman of the Houston Chronicle will be the guest of honor at a Texas group, a Carolina group will cover Apple Music, and a Florida group will look at iCloud. Some other topics on the list for the week include Numbers, ad agency industry trends, 3D printing and a picnic.